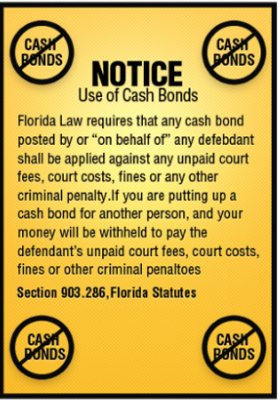 The full amount of the bond is posted by the defendant or on behalf of the defendant in what is called a cash bond. If they defendant attends all court dates, the depositor of the cash bond will receive back their money, less any court costs, court fees, fines, and other criminal penalties. A surety bond is purchased through a bail bondsman. The purchaser pays a set fee to a bail bondsman who in turn presents the court with the bond. As long as the defendant does not miss any court dates, no further monies are paid to the bail bondsman. If a defendant skips bail and doesn’t appear at a court date, the bail will be surrendered. In the event that a defendant’s bail is paid through a bail bondsman, the bail bond agent has the authority to locate the defendant and surrender him or her to the court. First appearance is a defendant’s first appearance in front of a judge. Florida law mandates that when an accused person is taken to jail, they appear before a judge within 24 hours of arrest. At this appearance the judge will review the case and address the matter of the defendant’s bond. A monetary bond amount will be set for a defendant who was arrested under “no bond”. A previously set monetary bond may be revoked and a defendant will receive “no bond” status. The monetary amount for the bond may be raised, lowered, or remains the same. The defendant may be placed on supervised release. In this case defendants must report regularly to the Pretrial staff until their case is disposed, and may sometimes be required to comply with special court-ordered conditions such as random urinalysis, drug and alcohol evaluations, AA/NA meetings, curfews, etc. Defendants with significant community ties, who do not pose a threat of danger or risk of flight, may be released on their own recognizance (ROR) and allowed to return to court without any monetary responsibility. Copyright 2016 Big Johnson Bail Bonds Website Design By Murnet Technologies Inc.